The specifics of different app notifications;. What kind of notification would work the best for your B2B or B2C marketplace app? Tips on how to how to build notification system your customers will love, taking into consideration in-app messaging and mobile push notifications best practices. Push notifications are the very ‘rockstar’ of mobile notification system these days. This kind of notifications has become popular with the rise of smart devices but, actually, take their beginnings from the early 2000s. Such notifications are used for various purposes in the apps of random types. Remind user of to-do tasks, your friends’ birthday dates or the future events - it’s by far not the complete list of push notifications’ functionality. What’s more, all of this reminder-updating-stuff is made on the background, without the need to constantly check the app. We offer you to learn how push notification works and more about mobile push notifications best practices by reading ‘How to Implement Push Notifications for iOS and Android In React Native’ article. 2. In-app messaging examples. How does in-app messaging work? This is another known solution among the various types of mobile app notifications. In-app messaging requires user’s in-app presence. Among widespread in-app messaging examples there could be different offers, marketing messages from app’s producer, account or personal info-related notifications, and the list goes on. 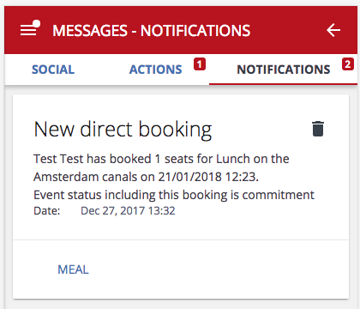 At Apiko, we’ve dealt with the development of the Netherlands-based event management marketplace app, called Meals Unite. It’s (primarily) a mobile marketplace which allows you to arrange meal sessions by hosting your friends or complete strangers to meet the new people, right at your home. The product with such concept surely makes us get to know each other a bit closer via live communication and food culture. Currently, the app is available for Android devices. 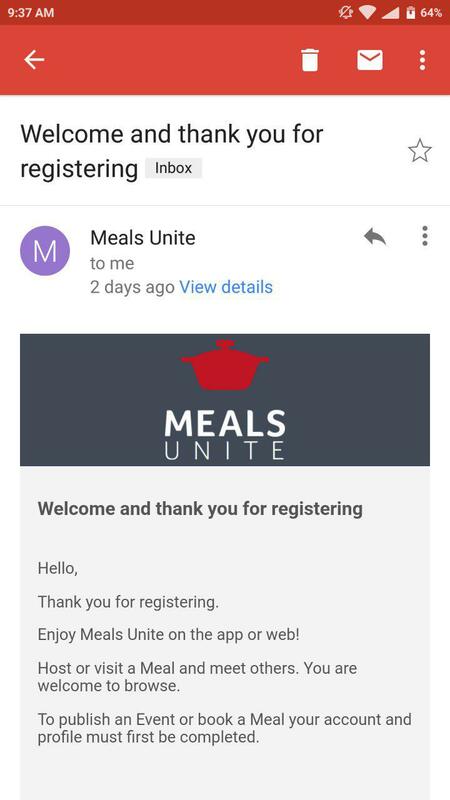 Try it out and download Meals Unite from Google Play. Experiment and determine personal in-app messaging or mobile push notifications best practices. SMS alerts/ text messaging notifications. Such alerts might be helpful when it comes to the events planning, reminders or promos. As much as push notifications, this kind of notifier provides the user with a quick info on their status without the urge to directly interact with the app. Email notifications, just like SMS alerts, but being sent right to your mailbox. Email notification system, for the most part, is used for onboard messages, offers and polls a company sends over their customers’ database. 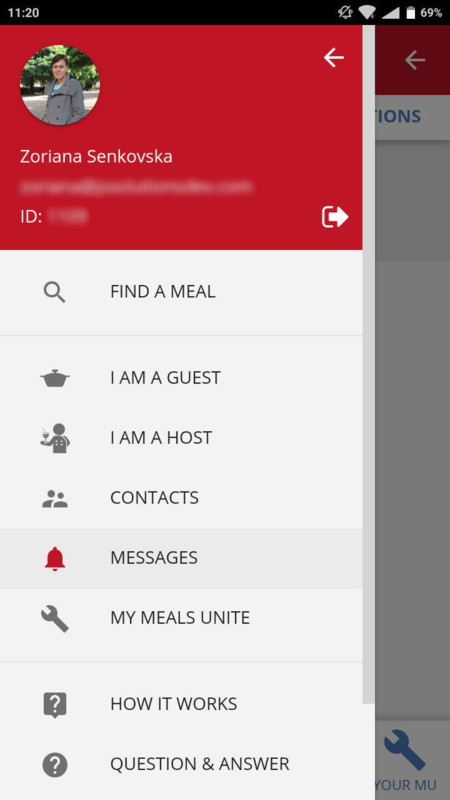 In-app messaging, email notifications, and SMS alerts system. How to build notification system of 3-in-1 kind? Let’s see how to create SMS, email and in-app notifications sending mechanism and its API organization. Below you can find end to end notification sender example (simplified). How can the given approach benefit the development of various types of mobile app notifications for your marketplace project? Easy to use - only 3 arguments to send a notification via multiple send methods. 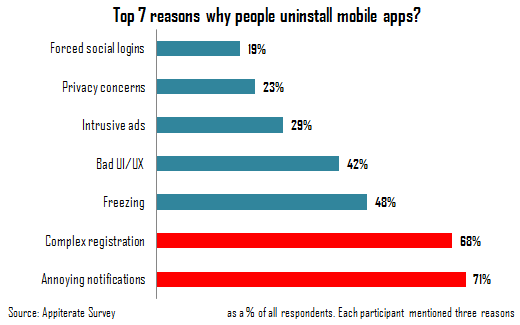 There is no strictly determined rule what type of mobile app notification to implement. You can give a try to all 4 notification kinds mentioned in the article: push notifications, email notification system, text message notification system, and use in-app messaging best practices. Keep notifications simple in design and provide them with native look and feel. You certainly don’t want your customers and users to have this Lisa-Simpson-bored-face when using your marketplace app. Well, no explanations are needed. We hope that this article has shed some light on the notifications realm and various types of mobile app notifications for marketplaces. Here we’ve tried to answer such questions, as what mobile push notifications best practices are, how in-app messaging works, and how to create SMS alert system and email notification system.